The PX771A has been discontinued please see the PX5200 as a possible substitute or contact our sales department. 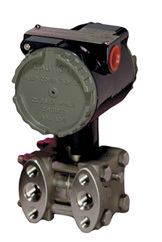 The OMEGA™ PX771A low power pressure transmitter is a compact, high performance transmitter, designed to accurately measure differential pressure and transmit a 4-20 mA signal. The PX771A has an adjustable range with a turndown ratio of 6:1; it comes factory calibrated at the highest span. Ranges from 17 in H2O to 300 PSID are available. Zero and span adjustments are available inside the electronic housing. The zero point can be elevated and suppressed up to ±600%. This transducer consists of an internal silicon diaphragm into which piezoresistive strain gages are diffused, then interconnected to form a pressure sensitive wheatstone bridge. Max. Loop Resistance: (supply voltage-7) x 50 .